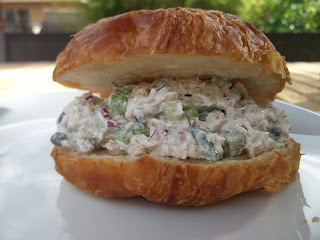 This was the best chicken salad sandwich we have ever had. It was really really good and easy to make. The capers really add to the chicken and the dill and sour cream create a delicious dressing for this salad. We will definitely be making this again soon. We used a rotisserie chicken meat from Costco. There was both brown and white meat in the salad. 3. Mix and serve over bread.. or lettuce.. or eat by itself! Best Chicken Salad recipe ever. Nothing, it was pretty perfect. No Change except maybe make more!